It was just one of those nights Saturday at Auburndale Speedway. The heat races were run off in a snap allowing the fans to enjoy a nice autograph session on the track plus the kids made out like crazy as 108 Easter baskets were handed out. Things changed come feature time as some wild and wooly action took place. Fortunately the fans were headed home before it actually became Easter Sunday. The headliner event of the night was the “Easter Bunny 50” for the Sportsman cars. Just 12 cars checked in but, as could be seen from the laps turned in qualifying, it was a quality group of machines ready to do battle. Brandon “Bones” Duschscherer was easily on his game right away tripping the clocks at 14.270 seconds for quick time. Right behind “Bones” was Brett Jenkins who turned in a solid lap of 14.309 followed by the 14.331 lap of Roger Blevins who was wheeling “Big Daddy” Dave Colpritt’s #4. Rounding out the top five in time trials were Devin McLeod and Brandon Morris. Being fast in qualifying proved to be a moot point as the top ten fastest were inverted for the start. Ninth and tenth qualifiers Brandon Martin and Bobby Mills elected to start scratch, though, placing eighth fast qualifier Brooke Storer on the pole for the 50-lap run flanked by Tim Alexander. Storer sped out to a good-sized early lead while Adam Briggs charged to second with McLeod right on his tail. Coming off turn two during the second lap, McLeod made an inside move on Briggs but the two cars became locked together stopping almost instantly and scattering the field behind them. Several cars received some type of minor damage trying to avoid the altercation. Fast qualifier Deucscherer ended up turned around in turn two with some damage to the front body work of his car. It took several minutes to get the McLeod and Briggs cars apart. Both McLeod and Duchscherer pitted for quick repairs while Briggs stayed on track although all three were relegated to the rear of the field for the restart. Brandon Morris restarted in second but soon found himself in third as Charlie Brown, who had not even qualified and started tenth, charged up to second on the fifth lap. Morris returned the favor two laps later while Duchscherer had already worked his way back up to fifth then slid by Brown for fourth on lap ten. Duchscherer continued his charge, passing Roger Blevins for third on lap 18. Meanwhile, Storer and Morris had begun to put some distance on the field but that all changed on lap 22. Bobby Miller and A. J. Olender, who were about to be lapped, tangled going into turn three right in front of the leaders. Storer dove low but the rear of her car clipped Olender’s machine ripping the driver’s side door off. Morris chose to go high and ran out of room as he clobbered the wall avoiding Mills’ machine. Morris’ car was towed off the speedway as he was done for the night as was Mills. The rear cover of Store’s car was torn loose but it was removed during the red flag by track crews with no penalty. Olender pitted and returned sans driver’s door. As the field re-fired, Duchscherer could not get his car in gear and he again had to head to the pits. “The car was stuck in second gear so I went in to get it checked,” said Duchscrerer. “As soon as I pulled in the pits everything freed up and was OK other than the fact I had to go to the back again,” he continued. Storer was hitting all her marks and driving a solid race out front while all eyes were once again on Duchscherer who took fourth on lap 26, then passed Briggs for third on lap 38. Storer had things pretty much in hand at this point with Brett Jenkins in second but not able to really mount a challenge. All of a sudden it looked as if Storer’s “luck” was in jeopardy as Olender spun in turn four to bring out the caution and set up a one lap dash to the checker. That allowed Duchscherer to move right up behind Storer for the restart. But this time there would be no more hard luck for Storer as she held strong to the finish as Duchscherer and Jenkins bounced off each other several times with Duchscherer crossing the stripe in second in front of Jenkins, McLeod and Brown. Earlier in the week Storer had posted on her Facebook page that she was thinking about stepping away from the sport after some recent disappointing finishes. However, around mid week, her team decided to get the car ready for Auburndale and now are really glad they did as everything tended to work in their favor most of the night. Blevins came home in sixth followed by Alexander, Martin, Olender, Briggs (who spun out in turn two on the final lap), Morris and Mills. The Modified Mini Stocks were back on the card for the second time this year and showed up in force as two heats were needed to set the feature field for the 17 cars entered. Defending track champion Chris Spring won the opening heat while Fred Harrison claimed heat race number two. After the initial start was aborted due to a Tim Scalise spin in turn two, Harrison jumped to the point only to see the yellow flag wave at the end of lap one as Ray Miller spun in turn two with help from Mike Kerrivan who went to the rear for the restart. Just as the field was about to completed the second lap, Jimmy Frazier was spun in turn four where he was t-boned by the machine of Kelly Hahn. Despite a big dent in the driver’s side door, Frazier returned to action but Hahn’s car was done for the night. Third-running Spring then had to pit before the restart as a tire went down. After nearly a half hour, the field finally completed the second lap with Keith Roggen forging his way to the front. The field stayed under green until the 14th lap when Scott Bumgardner went for a spin courtesy of Scalise who went to the back for the restart. Spring was charging again as he took over third on the restart just before Bumgardner and Frazier tangled in turn four with both being hit by Kerrivan’s car. Fortunately all three were able to continue. Sixth through tenth were Clint Holmes, Bumgardner, Jamie Dixson, Kerrivan and Rachelle Rudolph. Completing the finishers were Chris Falkner, Jimmy Wood, Dave Barnett, Ray Miller and Hahn. Dave Davis and T. J. Tanner did not start. Roy “Bubba” Healey led all the way to capture the 25-lap V-8 Bomber feature. After a lap three altercation on the front stretch between Mike Pitts and Danny Burchfield, the race ran green to checker. James Wright III started deep in the field but worked his way to second by the 16th lap. By that time Healey was in a different zip code as he drove to an easy victory over Wright and a resurgent Burchfield. After being relegated to the back of the field for “jumping” a restart at the beginning of the race, Eddie Hartin worked his way up to fourth at the finish ahead of fifth place Travis Roland. Sixth was Ronnie Abney trailed by Jeff McCaw, Jamie Castleberry, Blake Smith-Jones, Jody Gill and Pitts. Aaron Holmes did not start. Heat wins went to Hartin and Burchfield. Yet again it was a family affair in the Q Mini Stocks as heat winner Chris Narramore, Sr. led the entire 20 lap distance for his fourth win of the season over his son Chris, Jr. Bruce Cozad scored yet another third place finish followed by Duker Holley, Fred Martin, David McCaig, and Colt Cecil. Bryton Horner scored his first-ever win by taking the checker first in the Mini Cup heat race. Horner then led the first four laps of the feature before giving way to Douglas Herrin, Jr. From that point Herrin checked out for his second win in a row. Horner and Clay Samuels got together on the final lap allowing Russell Bush to slip by for second with Samuels coming back for third ahead of Kyle Trinklein, Bill Rychel, Horner and Maria Martins. James Wright III was the “Guest Driver of the Week” in the #42 Saturn station wagon and he led all the way to win the Scrambler feature over Danny Burchfield, Fred Wilson and Travis Todd. Kelly Hahn did not start the feature race. The track will now take two weeks off for the “Night of Destruction” this coming Saturday and the Polk County Music Fest April 14 and 15. 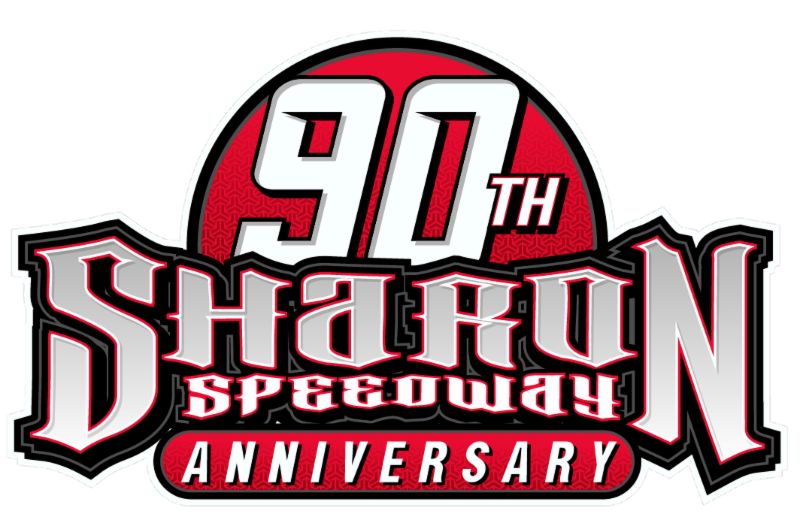 Stock Car racing returns on April 21 with 125 laps on tap for the Super Late Models. 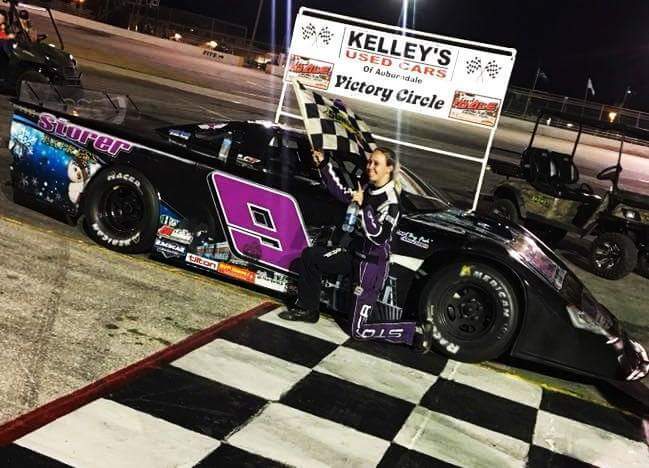 1) Sportsman winner Brooke Storer – her first Auburndale Speedway win!